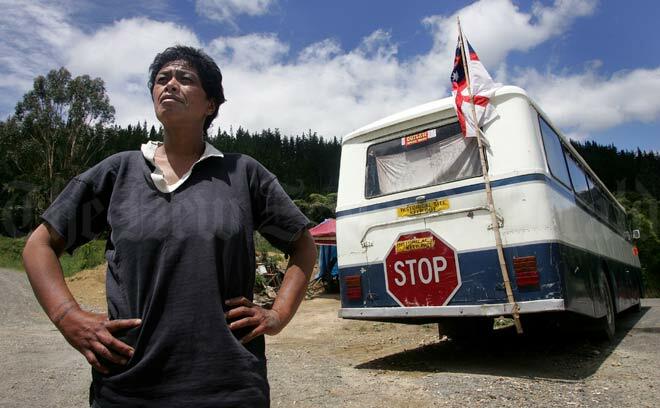 Tania Te Pairi guards a roadblock at the entrance to the road through what was then Te Urewera National Park in December 2006. The roadblock was set up by an Ōmuriwaka hapū, which claimed the public road went through private Tūhoe land and people using it were trespassing. Te Pairi told a reporter that people could ask for permission to use the road and these requests would be considered by the hapū. Later, the public were charged $10 a head to use the road. The dispute ended in April 2008 when a new road was opened that bypassed the hapū’s land.